With the current situation of worldwide frequency regulations and the reallocation of digital RF spectrum, the understanding and ability to frequency manage requires a true investment. Last summer we entrusted our frequency management to the Invisible Wave X, RF Command System by Kaltman Creations. After a long evaluation phase and the use on many production events, we have determined that our investment in the Invisible Wave X has become so valuable that we simply can’t live without it! There is an ever-increasing trend for the use of wireless microphones, compounded with the use of in-ear systems; all in the same frequency spectrum. So much so that our standard productions now include 60 microphone channels with a potential requirement for 100 channels or more! Even our corporate/industrial productions now incorporate a large number of wireless microphones, and in many cases these channels require standby/doubling of backup channels. Plus, many of these corporate shows incorporate musical show blocking, which furthers the need for more frequency spectrum. In some applications, like for "Art on Ice" (the world’s largest ice show) with live music and more than 70 channels and the "Energy Stars for Free" TV show and live concert with 15 top acts and 110 channels, the overwhelming number of required channels is only compounded by the increase in wireless use and the reduction of RF Spectrum. And next year presents an even greater challenge for us, especially with our simultaneous transmission, because Switzerland’s LTE service (high-speed wireless Internet) will be operating in the UHF bands with transmitters at 50+ watts, and our little 30mW transmitters will not have a chance. The biggest concern with the new LTE systems is that nobody really knows, or can predict, what the intermodulation interference will be like in a hall with thousands of mobile devices all radiating at once and at levels 100x our microphone levels. Thanks to the Invisible Waves X, RF Command Center, we can now make onsite frequency measurements and ‘see’ the spectrum, including the DVB-T and LTE transmissions. Along with the ability to see all RF activity and frequency coordinate our transmitters, the next biggest advantage of the Invisible Waves X is its monitoring features for use during a live event. Popular events draw media and camera crews along with their wireless data devices and non-frequency coordinated transmitters. The Invisible Waves X offers a rogue interference alert which they call a UFO Alert (Unidentified Frequency Alert) and a Click-To-Listen (CTL) function. The UFO Alert warns us when unexpected transmissions enter our spectrum and the CTL function allows us to listen in to help identify who the offender is. There are a large number of intermodulation products when using a large number of radio microphones, and intermodulation calculation becomes very important. We use the IAS software by Professional Wireless Systems to assist in intermod calculations. The Invisible Waves X has the ability to import and export raw CAS data files, making it easy to incorporate the data from the IAS, and then, of course, we use the Invisible Waves X spectrum display to plainly see the open RF blocks and RF holes for transmitter frequency placement. We have found the Invisible Waves X RF Command Center to be an invaluable and cost effective solution to addressing our growing number of frequency needs, and to manage both our radio systems and potential interference. 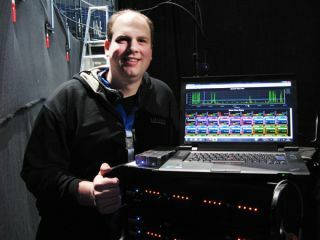 Elias Ruh is currently the head of sound for Habegger AG (a company that deals in media events and media architecture). He has recently studied and taught acoustic engineering. A professional musician and the son of a music teacher, he has spent most of his professional life as a sound engineer for a variety of companies.